For Aleppo Residents Under Siege, A Risky Journey To Relative Safety : Parallels Civilians in the rebel-held side of the city are fleeing for their lives, dodging crossfire along the front line to reach the regime-held part of the city. "It was all so sudden," one woman tells NPR. 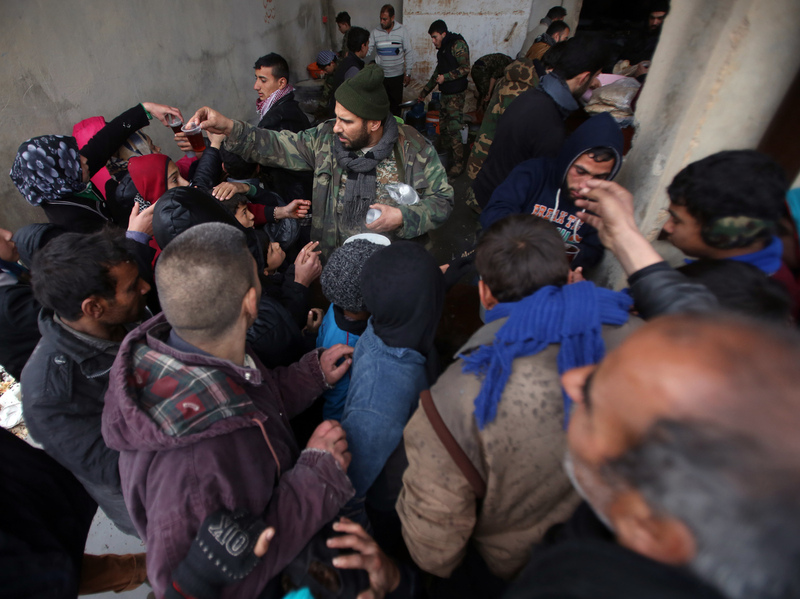 Syrians who fled from Aleppo's rebel-held areas queue to receive food on Dec. 1 at a shelter in the neighborhood of Jibreen, east of Aleppo. She'd grown used to living under harsh siege conditions, and never thought she'd flee. "It was all so sudden," she tells me. "We weren't mentally prepared. I used to tell myself I'd rather die in my home than cross to regime areas." But conditions deteriorated quickly with the resumption of airstrikes. She describes two weeks of constant bombardment. Earlier this week, her house was hit and destroyed. Amid the total chaos that ensued in her neighborhood, people running with their children, she and several neighbors made a split-second decision to flee to the regime side of the city. Their group of families braved the front line, dodging the crossfire. Some were shot down along the way. Many cast aside their suitcases and clothing bundles — their last belongings — to run faster. Joshua Landis, a Syria expert and director of the Center for Middle East Studies at the University of Oklahoma, says it's no surprise the families joined that mad rush. "The days for the rebels in Aleppo are numbered," he says. "The regime has amassed over 50,000 soldiers from all different militias in the army and so forth. They have overwhelming forces. Estimates are there are 8,000 to 9,000 rebel fighters and probably there's a lot less today. So the situation is untenable for the rebels. They can't get resupplied. It's a matter of time." At the same time, Landis says civilians are afraid of what's in store for them on the regime side. "There is nobody who is your friend in this situation," he says. "The rebels are not your friend — they're using you as a shield. And the regime is not your friend because they've been pounding you. They've seen you as a pawn, or as collateral nuisance." When civilians reach the relative safety of the government side, the Syrian authorities have lists of names. For any civilian fleeing the rebel side, Landis says, "They know this is the beginning of a long scrutiny." And that was true for the woman reached by NPR. As they fled, she told me, she and her husband, along with her sister, brother-in-law and their young children reached a no-man's land where they saw their first government soldiers. They directed the family to a school stadium, and told them to shelter in place. "Every time someone stood up, we'd tell him to sit down because of the snipers," she says. When the sun set, the soldiers directed them onward. Everyone from children to the elderly scaled the school's high walls, trekking over broken glass and rubble. The woman tells me it was the most difficult day of their lives. After hours of walking, they reached an area firmly under army control. Their experience with the soldiers was mixed. "There were good men and bad men," the woman says. "A part of the army were helping people and made them feel welcome. Some soldiers even helped us carry heavy bundles and suitcases. And others literally dug their hands into people's pockets and robbed them." At a shelter in the Jibreen area of Aleppo, they were given blankets and food by the Syrian Arab Red Crescent. The care they received, she says, "was exemplary." It was there, surrounded by hundreds of families, that she realized just how many people had fled — from complete strangers to those she'd known her whole life. The Red Crescent, which works under the banner of the International Committee of the Red Cross, said Monday said it registered 4,000 people displaced to Jibreen alone. No one had more than a suitcase. "They fled with their souls and nothing else," the woman tells me. She and her relatives were held in the shelter for two days, while the army scrutinized their IDs. Then they were free to go. But outside, they encountered a maze of checkpoints. She describes officers sorting through piles of IDs, names getting mixed up. And, as many had feared, males got little benefit of the doubt. Her 20-year-old cousin was taken into mandatory army service. He was the only son to care for his disabled father, but with the family documents scattered, they had no immediate way to prove it. Her sister's 43-year-old husband was taken away for questioning. "They told us his name is on a wanted list," she says. "First, they told us he'd be out in a few days. Then they said it could take three or four months." She thinks the army officials simply want bribes. But even if the family can scrape enough money together to pay a bribe, she's not sure when or if her sister's husband will be released. The families had planned to stay in the city, but after their experience, they decided they wouldn't stay a day longer. The group fled Aleppo entirely, to the northern, rebel-held countryside. On the way, they were allowed to pass through army checkpoints and then they reached Kurdish-held territory, where they faced more scrutiny. She says they were almost turned back, but their driver pleaded and paid their way through. Finally they reached where they felt safest — rebel-held territory. Now there, she prays for those left behind — her rebel son and the women and children stuck in the tightening siege. She says, "I just want everyone to make it out of there alive."